There are a few tricks to modulating pitch in Zero that may come in handy for you. There is a neat trick for getting a very small amount of modulation for a drift effect. Also, phase modulation is shown as a way to get a fine tune sound. And on a slightly different note, if you want to transpose an operator using a Combinator button the procedure is provided. Here is a download of the patches created in this tutorial. Let’s start with finely controlling the tuning of an operator. The basic concept is that one of the modifiers can be used as a very small scale amount. 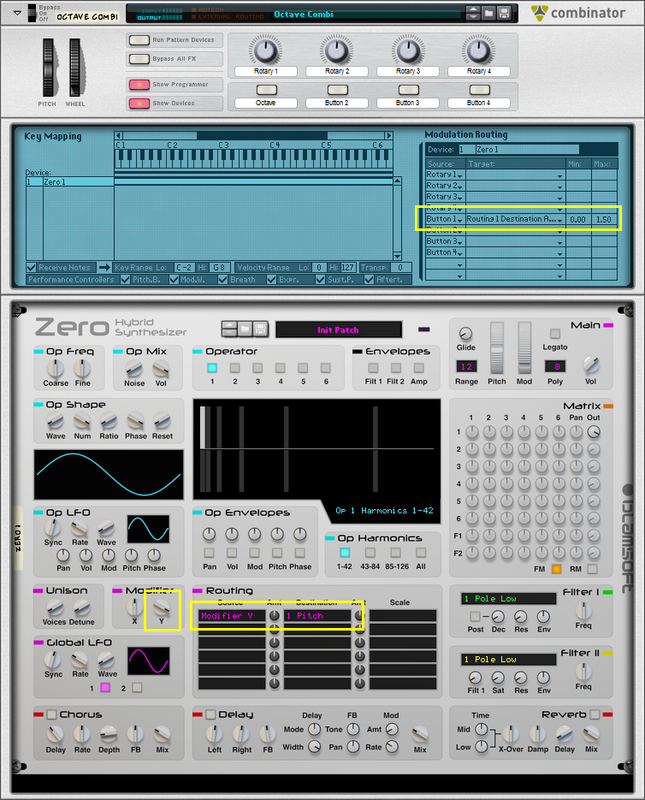 To set up the patch, create a new Zero synth and reset the device. Turn up the output of operator 2 and change the waveforms for both operator 1 and 2 to sawtooth. The two operators are exactly in tune so it just sounds like a single sawtooth. To set up the modulation, use mod matrix row 1. Choose LFO 1 as the source, 2 Pitch as the destination, and Modifier X as the scale. Now the trick is to set Modifier X to a very low value. If you hold shift while adjusting the knob, you can set Modifier X to -4.96. And then set the modulation amount knob to a fairly low value as well. Turn the scale amount all the way up. Slowing down the LFO makes the effect sound better. Now you have a drifting pitch in operator 2 that creates a phasing effect between the two operators since their tuning is slightly different. You can check your settings with the image below. If you’re after this sort of phasing effect, it’s possible to just directly modulate the phase instead of adjusting the fine tuning. In the following patch, we will fake a tuning difference sound by modulating the operator phase by an LFO and controlling the LFO rate with Modifier X. 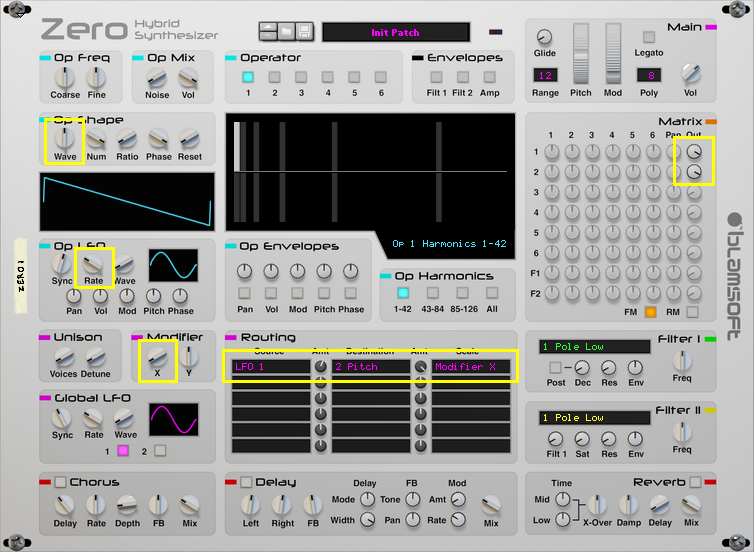 Create a Zero synth and reset the device. Just like in the last patch, turn up operator 2 and set operator 1 and 2 to sawtooth. This time in the mod matrix, route LFO 1 to 2 Phase with no scale. Adjust the mod amount to be about 2.5. And in the second mod row route Modifier X to LFO 1 Rate and turn the amount all the way up. Set the LFO 1 Sync to Free and the rate to about 0.15 Hz. The LFO changes the phase of operator 2. As you change Modifier X it adjusts the rate of the phase change. It sounds almost the same as a tuning difference. Since this sounds a lot like fine tuning you may want to experiment with both approaches to see which sounds better in a particular setting. You can check your settings with the image below. In some cases you may want to automate the octave of an operator. For example, you could transpose it up an octave for one portion of the song, and then set it back to the original octave. This can be done with carefully chosen settings in a Combinator. Start by creating a Zero synth and reset the device. Now right click on the synth and choose Combine which puts it in a Combinator. Set up mod row 1 with Modifier Y as the source and the destination as 1 Pitch. Turn Modifier Y all the way up. Instead of setting the mod amount knob in Zero, we will use a Combinator button to adjust the amount. In the Combinator programmer, set up Button 1 to control Routing 1 Destination Amount. Set the Min to 0. Now the Max is the important setting, it needs to be exactly 1.50 per octave. So set it to 1.50. Now pushing Button 1 transposes the operator by an octave. Here is an image with the settings highlighted. Directly automating the Pitch Wheel Range setting is not possible in Zero. But you can quickly get the same effect with a simple trick using the mod matrix. Change the Pitch Wheel Range setting to zero. Then in the mod matrix, route Pitch Wheel to Pitch. Now you can automate the Destination Amount to control the pitch wheel range. Hopefully, you now know how to control the pitch of Zero’s operators in some new and interesting ways. Happy tweaking!